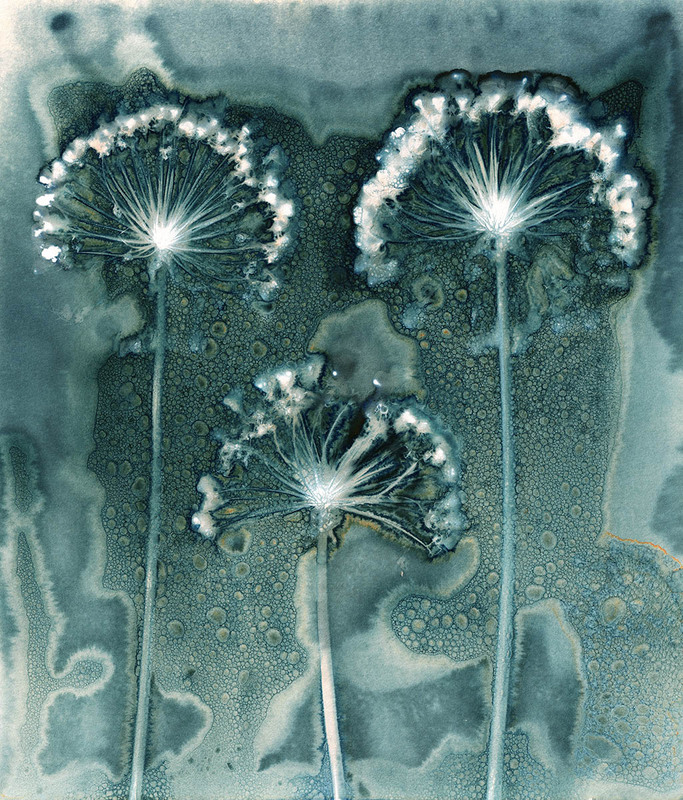 This image of three Allium heads was created using a technique known as wet cyanotype. Two chemicals, ammonium citrate and potassium ferricyanide, are mixed together to create a photosensitive solution which is painted onto the surface of watercolour paper and left to dry. This process needs to be conducted away from UV light, and once dry the paper must be kept in a light-proof bag until it is used. Photograms are created by placing a flat object such as leaves or flowers onto the surface of the treated paper with a piece of glass over the top to keep it in position. The paper is then exposed to ultraviolet light – either the sun or a UV light. When using the sun, exposure times vary, depending on the strength of the sun, time of day, weather, time of year and the object being imaged. Wet cyanotype is a modified version of the 19th century photographic printing process, introducing moisture, in a variety of ways, onto the treated paper before exposure. The chemical reaction produces interesting fluid patterns and colours not normally present in a traditional cyanotype print. The resulting pieces are unique and present botanical prints in a different and painterly manner. Each piece is created with plants and flowers from my own garden and exposed using only the North Yorkshire sun.